Even Ariana's cousin thought it was her. 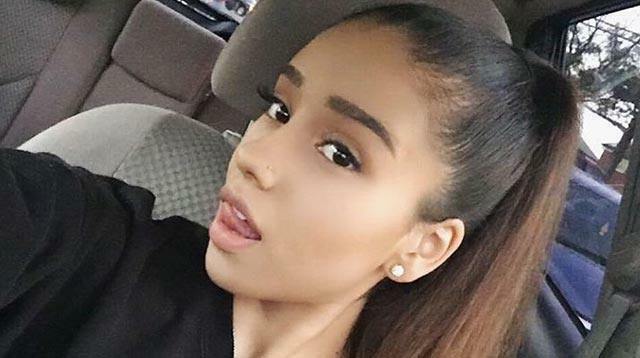 We've seen some intense celebrity dopplegangers in our day, but 23-year-old Ariana Grande and 20-year-old Jacky Melissa Vasquez are on a whole other level of twinning. The Virginia waitress looks SO much like Ariana, in fact, that Ariana herself allegedly commented on a photo to say that her own cousin couldn't tell them apart. Of course, it's not just the ponytail and facial features that make the resemblance so uncanny. Jacky's really got her signature duck face and wink down, and apparently shares the pop star's sense of style. "I've always been an Ariana fan! Ever since Victorious until now," Jacky told SweetyHigh. "I love her vocals, her style, her personality and just everything." Even so, she didn't notice the resemblance until people started pointing it out all the time. "In 2010, people in school would say I resembled Cat Valentine, who was Ariana Grande's character [on Victorious]. Even though my friends and other students would point it out, I didn't see it until a little later." And if you wanna emulate Ariana's signature look, she's got some advice for you. "My tip to those who want to emulate her style is to work that high voluminous ponytail! That is the most important thing in addition to rocking cat eye winged eyeliner and super long eyelashes. That's what makes Ariana, Ariana." And her confidence, of course!